One of the great karmic justices of recent years is the growing fame and influence of the Fluxists, the long obscure band of 1960s philosophical jokers. 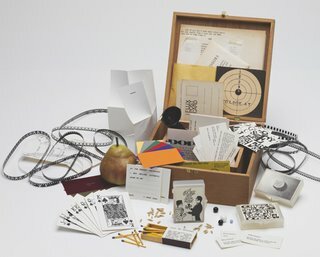 They’re the focus of a cool show at Harvard right now called “Multiple Strategies: Beuys, Maciunas, Fluxus,” which I review here. 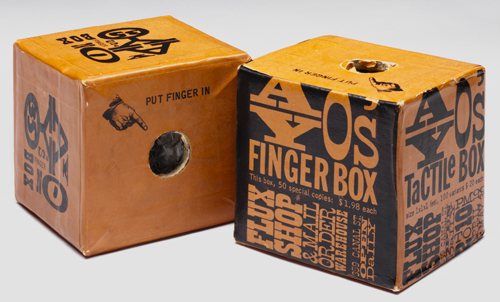 Shown here are, at top, a box of various Fluxus puzzles, films, toys and trinkets – including Vautier's matchbox in the foreground – organized by George Maciunas for the “Flux Year Box 2” (late 1960s) and, below, Ay-O’s “Finger Boxes” (1964), which are filled with foam or feathers that one could finger if the boxes weren’t safely secured in museum vitrines. The influence of this stuff is apparent locally in The Institute for Infinitely Small Things (right down to George Maciunas’ 1966 “Fluxworker Lab Coat”), Harvey Loves Harvey, and Andrew Mowbray’s 2005 performance “Just for Men” at the Boston Center for the Arts. Sonic Youth performing George Maciunas’ “Piano Piece No. 13 (Carpenter’s Piece) for Nam June Paik” (1962), which I reference at the beginning of my review. Yoko Ono performing her seminal “Cut Piece”, which may or may not be part of her Fluxus work depending on how one defines such things. This purports to be her 1965 performance at Carnegie Hall. Nam June Paik’s “Zen for Film” (1964). A strip of clear film leader from the film is included at Harvard. What seems to be a couple George Maciunas films exploring the formal properties of the medium. “Multiple Strategies: Beuys, Maciunas, Fluxus,” Busch-Reisinger Museum, Harvard University, 32 Quincy St., Cambridge, Feb. 24 to June10, 2007.